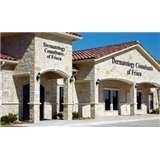 Dermatology Consultants of Frisco (Frisco) - Book Appointment Online! In our practice, the entire family can come to one location to receive excellent care for their general, pediatric, surgical, and cosmetic needs and concerns. The practice won Frisco Style’s “Best of Business” award in 2010 due to Dr. Weisberg’s compelling vision. Located at the corner of Legacy Drive and Eldorado Parkway, the office of Dermatology Consultants of Frisco is a 10,000 square foot state-of-the-art facility. The office was built in a convenient location to provide excellent dermatology services and good customer service as well. As a part of their cosmetic dermatology services, they offer a complete array of lasers, intense pulsed light (IPL), Botox, fillers and surgical options under one roof and can create custom solutions for their patients. Dr. Chappell was very thorough and personable.